SEOUL, South Korea, July 26, 2018 /PRNewswire/ — KT Corp. (KRX: 030200; NYSE: KT), South Korea’s largest telecommunications company, completed a new digital system for national identification in Tanzania, marking major progress for the company in Africa as KT continues to tap into new business opportunities throughout the continent. 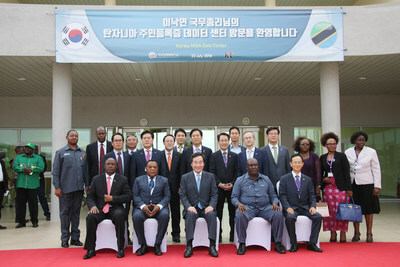 South Korean Prime Minister Lee Nak-Yon, Tanzanian Home Affairs Minister Alphaxard Lugola and other officials from the two countries visited the main data center for Tanzania’s countrywide registration system on July 22. The data center is located in Kibaha in eastern Tanzania. The recently launched registration system is a significant step in KT’s endeavor to expand its cooperation throughout Africa. KT is currently working on various projects to improve the ICT infrastructure in the world’s second-largest and second-most populous continent, including high-speed communications networks in Gabon and Botswana and a public security network in Angola. In May, the Korean telecom leader completed the construction of Africa’s first nationwide LTE network in Rwanda and also won a project to establish a surveillance system that will help prevent illegal fishing in the West African countries Sierra Leone and Liberia. The new IT-based public administration system in Tanzania includes the digital national identification data center in Kibaha, a backup center, 13 regional resident registration offices, a fingerprint identification and management system, a network control system and a resident registration website. KT formed a consortium with Samsung C&T Corp. to undertake the 52.6 billion won (US$47 million) project, which was commissioned by Tanzania’s National Identification Authority. The project began in April 2015 and included the participation of 15 Korean small- and medium-sized companies. KT remains responsible for the system’s repair and maintenance until June 2020. KT expects that the digital registration system will help boost the economic and social development of the East African country. Tanzania has a population of some 56 million people and a 6 to 7 percent annual economic growth exceeding that of its neighbors. Tanzania is a mountainous and densely forested country sprawling over a vast territory in the African Great Lakes region, which presented many challenges to the construction of a nationwide digital public administration system. While physical national registration offices were as far as 1,100 kilometers (684 miles) away from one another, they are now connected on the new digital system. There were particular difficulties constructing buildings and laying optical fiber cables in the northwestern region of Mwanza, also known as the City of Rocks. KT’s vast experience in building and operating data centers throughout different countries helped overcome the acutely challenging obstacles in Mwanza. The Tanzanian government is expected to soon implement the new digital system for national identification. The nation hopes to use the system to improve public services in education, hygiene and healthcare. The government also expects to use the system to alleviate some of the country’s social problems by targeting certain crimes and tax evasion.